We have several social circles in our life here in Bangkok. One of those circles is with Tawn’s high school friends, most of whom are married and are starting their own families. Many of those friends are making a concerted effort to involve Tawn and me in their children’s lives. Last weekend we spent two days with three of these families – a total of four children under the age of four – at a “family friendly” resort in Cha-am, a beach town about three hours south of Bangkok. Both afternoons we spent time in the pool, which thankfully was located so that it was in the shade. The weather was pleasant with a nice breeze, and all of the children enjoy the water. 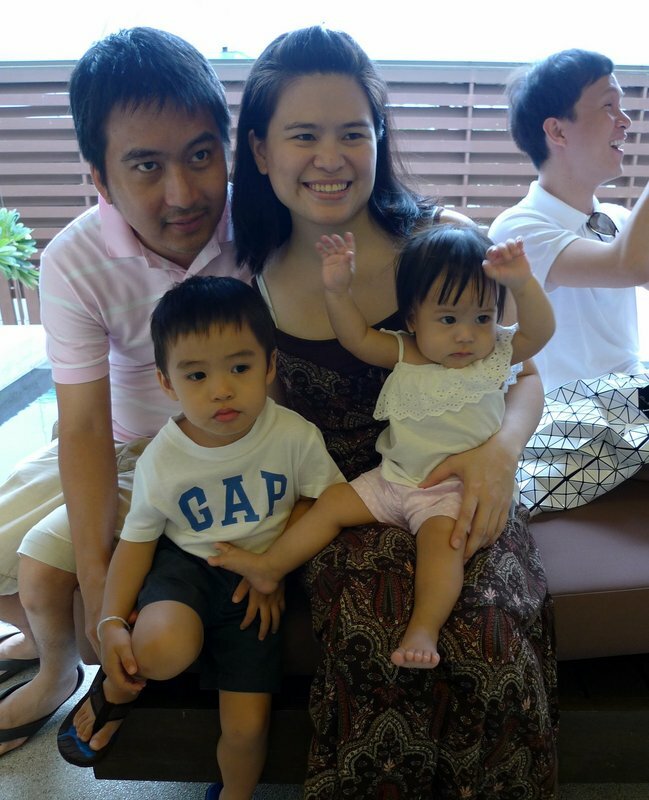 The experience was interesting on a number of levels, not the least of which was a chance to observe some of the differences between Thai and American parenting styles. Saa and Kiri. The following afternoon, the weather was just a bit cooler and breezier and when we put Kiri in his inflatable rocket, you could tell he was cold because his upper lip was shivering. It was very cute, but kind of sad, too. Eventually he warmed up a bit. 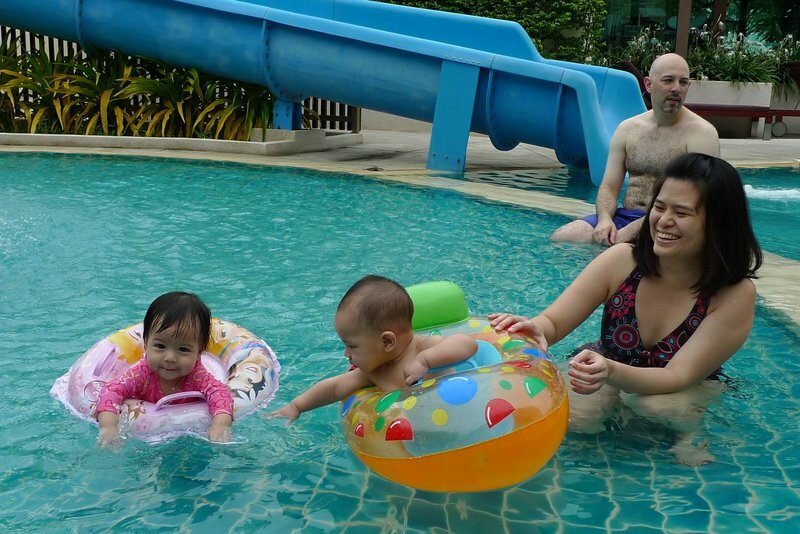 In the background, I supervise as 3.5-year old JJ pulls his little sister around the pool. 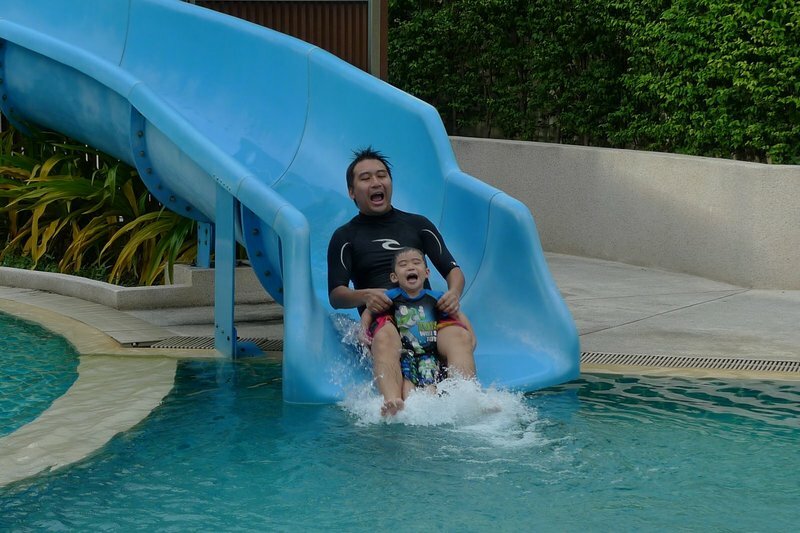 This photo is of Job, Saa’s husband, going down the water slide with JJ. There’s a bit of a story here that illustrates some of the differences in parenting styles. Of course, I’m making broad generalizations, but Thai parents tend to be much more protective of their children. For example, Jaeda and Kiri are both just at the point where they have the strength to stand and Jaeda can even take a tentative few steps if she is holding onto something. But they never have the opportunity to fall because someone is always holding them or reaching out to catch them if they lose their balance. The American style is more inclined to let them fall, pick themselves up, and try again. Now, the first day we were in the pool, JJ decided after about 10 minutes that he didn’t want to wear his floatation devices and wanted to move from the 45 cm-deep pool to the 80 cm-deep pool. He is pretty comfortable in the water and even in the deeper pool his head was still well clear of the water, so that was okay. After about an hour, he decided he wanted to try the slide and kept riding with his father. The next day, everyone else was still lounging about upstairs so JJ and I went down to the pool together. After a few times down the slide, he decided he wanted to go down by himself. I thought to myself, “Okay, I’m not sure his parents would like this…” but I waited at the end of the slide to catch him if he had any trouble. By the time his parents came down to the pool along with everyone else, JJ was going down the slide again and again, each time on his own and each time with no troubles. Sure enough, Saa was a bit surprised, but to her credit quickly realized that her son was able to handle himself without any trouble, although she did have to lecture him about not cutting in front of people who were waiting for the slide! 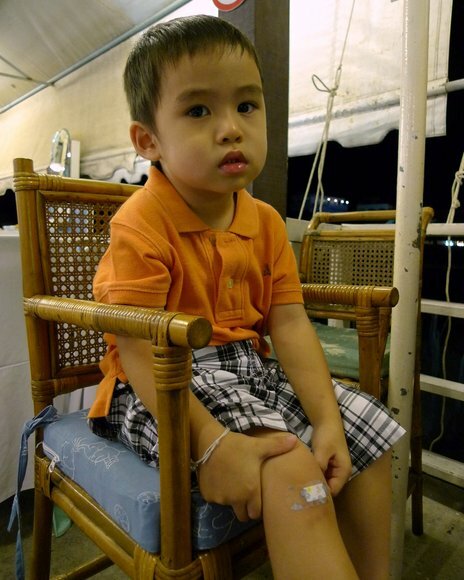 Later the first evening we were at the pier for a seafood dinner and JJ fell down and (ostensibly) scraped his knee. I didn’t see any broken skin but he insisted on having a plaster with blue elephants on it, applied to the injury. Before the plaster, he was holding an ice cube to the injury and then had great fun dropping the ice cube down his shorts leg. His mother did not find this as amusing. 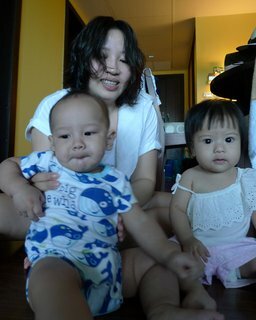 One recurring theme for the weekend was that every time we got Kiri and Jaeda near each other, Jaeda would crawl over to Kiri and try and hug and kiss him, although with her fine motor skills still under development, it looked more like a mauling. Kiri didn’t like the attention, which Jaeda found greatly amusing. Good for her, taking rejection lightly! 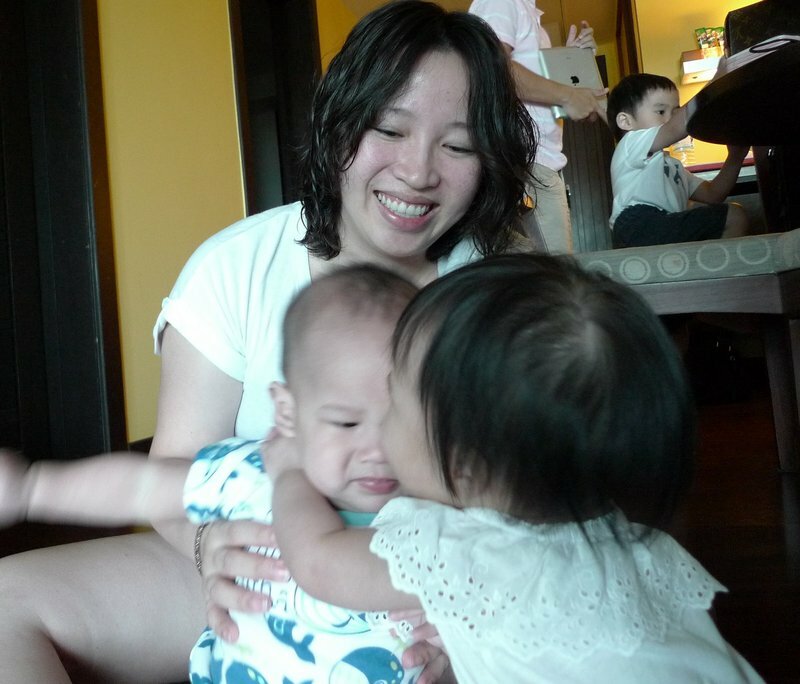 In this series, Kiri’s mother, Tao, tries to wrangle the two for a group photo. Eventually, Jaeda caught Kiri at an unguarded moment and was able to plant a kiss right in the middle of his face. That was the end of our attempts to get a picture of them together! Job and Saa with JJ and Jaeda with Uncle Tawn in the background. Not sure why Jaeda was trying to raise the roof. JJ is currently attending an international preschool where the primary language of instruction is English. Nonetheless, he wasn’t very forthcoming in English and we communicated mostly in Thai until late the second day when he did start using some English. In attempting to set up the previous family photo, JJ kept laying down to avoid having his picture taken. So I rotated the angle 90 degrees and got this photo, which I think is kind of an interesting one. Tao with her son Kiri. Somehow, I didn’t manage to get a picture of her husband Pai. Kiri took quite a shine to me, as he seems to like being lifted up in the air and then dropped down suddenly and I was the only one who would do that again and again and again. Have I mentioned that my left shoulder has been sore since last weekend? 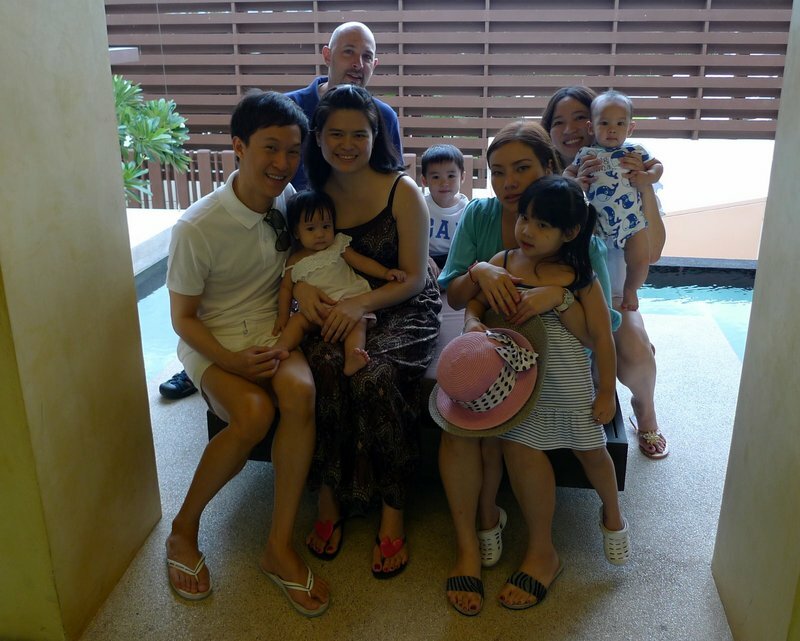 Group photo: Tawn with Jaeda and Saa; me with JJ; Tawn’s friend Jaa with her daughter Nam Ing; and Tao with Kiri. I’m glad we had the opportunity to spend more time with Tawn’s friends and their children. It is important for them to be exposed to a wide variety of people and while their parents all speak English well, having the opportunity to learn to speak with a foreigner is good for the children. In fact, in the days since our return, Tao called Tawn to say that she’s enrolling her son in an infant swimming class and was wondering if Uncle Chris might like to come along. This entry was posted in Uncategorized and tagged children, culture, friends, Tawn, Thailand by christao408. Bookmark the permalink. That looks like a wonderfully fun weekend! 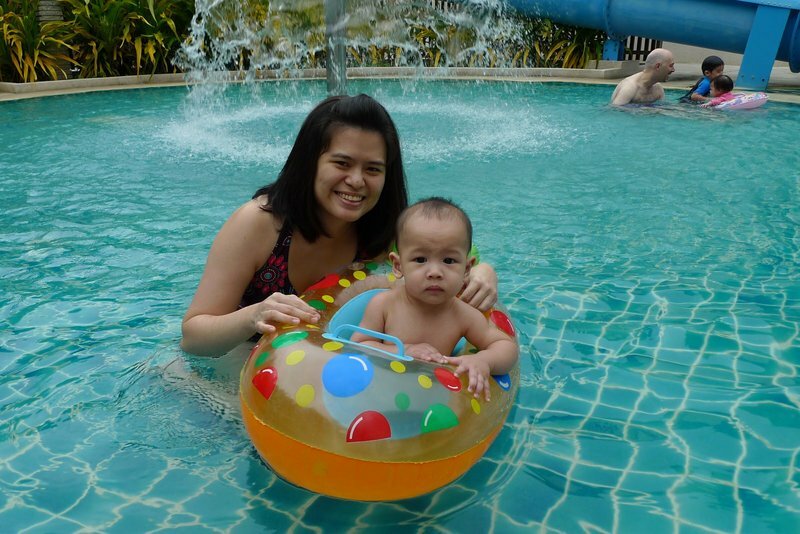 My wife and I spent a few days at Hua Hin and we enjoyed the beach town. We rode in on the train to the colorful train station there. Night market was fun and so were the topiary “elephants” on the Sofitel grounds. We took a taxi to the Palau waterfalls in the national park and hiked to the falls while the taxi waited (about $20 for the ride). I wish I knew of the place that had a shaded pool, I have the complexion of a typical redhead. This seems to be an area of lots of development, hotels and golf courses. Cha Am was a little bit to far for us, not a lot of public transportation there, or so I thought. You can walk, taxi, or take a tuk tuk in town, plus the train station and bus station to go back to Bangkok.It is nice to spend time with fine people and these kids are great, thanks for sharing. What a wonderful time all of you had! I am sure the children cannot have enough of you.Yeah I read that typo too, about Tawn’s children! Cute children. Glad to hear about this weekend. All children should have uncles to care for them. looks like a fun weekend! i totally understand about being cold in the pool… it has to be a very hot, sunny day before i spend any length of time in the water, and even then my lips are apt to turn blue! @CurryPuffy – @ZSA_MD – @yang1815 – Note to self: must pay our editor more…@kunhuo42 – That’s the challenge with being so skinny – no fat to insulate yourself! XD@jandsschultz – Indeed they should. @Inciteful – Glad you thought so. @Fatcat723 – There are many benefits to not being the parent. @Ricardo98 – Cha-am isn’t particularly interesting, in and of itself. Just a cheaper place to stay than Hua Hin and a bit more geared towards Thais. @slmret – It really was. What a nice photo journal of your weekend. Those children are BEAUTIFUL!!! And by the way, you look fine shirtless, Chris. When I had nursery duty at church and some of the children were crying, my husband could just come in the door, and the little ones would stop their crying! (And I was the one with the master’s degree in early childhood education!!! Go figure.) I was jealous and couldn’t figure out what his special secret technique was. You must have it too.